I’ve been wanting a standing desk at home, ever since our old Elastic office had standing desks. The key though is getting it to be the perfect height, and not spending a fortune. After some careful measurements I determined that my standing desk surface should be exactly 40″ from the ground, so that my arms at ~90 degree angles would fall perfectly on them when I’m standing (I’m 5’6″ or 5’7″). I recently had to look at two different legal documents (PDFs) that were mostly the same, but I wanted to spot any differences. My first attempt was to install the cross-platform GUI tool DiffPDF. This mostly worked but was annoying because it seemed to basically only diff within a page – so if your paragraph bumped to another page in the new version of the document, you couldn’t really spot changes. Then I installed pdftotext with macports: “sudo port install poppler”. From there you can diff the two text files, like normal. So finally I found a couple other useful tools, wdiff (for word-by-word rather than line-by-line comparisons) and colordiff to colorize the output. Installed with: sudo port install wdiff colordiff. And threw in a trick to avoid needing the .txt temp files. Beautiful! Now I can easily spot the specific words, nicely colored, that have changed. Only thing I would improve is for it to print only the lines with changes (plus 3 context lines above/below), rather than all lines. I’m working on invoice/receipt generation for Close.io and wanted to create simple PDFs using nothing but HTML. My blog post on the Close.io blog was pretty popular (18,000 pageviews & lots of HN comments) so I wanted to cross-post it here. We like to think of our sales software, Close.io, as having a lot of magic under the hood. When we do our jobs successfully, our users may not even notice, but their lives will be made a little easier. We try to make features just work without requiring users to think too much, even if that adds complexity in code. Most CRM and address book software make you enter your contacts’ phone numbers, email addresses, and URLs in specifically chosen separate fields per data type. You shouldn’t have to make a choice for each phone number, email address, or URL you enter for a contact. We just give you one place to enter all their contact information and we figure out what type of data is what. (Then you can 1-click call or email this person). Is taking a string and deciding if it’s either a phone number, email address, or URL particularly hard? No, but it’s “hard enough” that most CRMs and address books don’t do it, and we wanted to take the extra time to make our users’ lives easier, even if they don’t notice it. 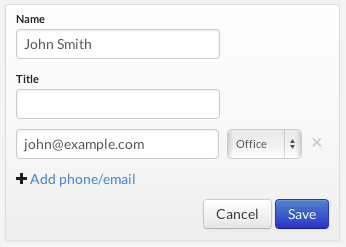 A recent iteration on the contact form was improving a fairly common scenario where you had email from somebody and wanted to save their email address onto a contact. Many email clients give you a string like: “John Smith” <john@example.com> when you copy the address. Originally if you tried to enter that as an email address in Close.io it would complain about it not being in the simple email format like john@example.com. Again — not particularly difficult, but something most software doesn’t do. This is the type of magic that many users won’t even notice or think twice about, but helping users avoid validation error messages is as much of a benefit as any new feature you could make. 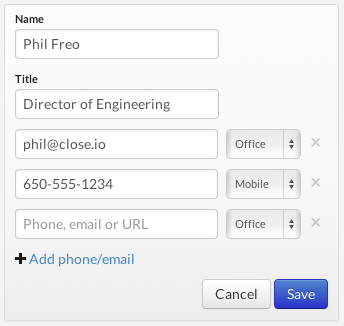 The first few times you try to send email in Close.io, it’s as simple as clicking the big “Email” button on a sales lead, typing a message or choosing a template, and clicking send. We already know your email address when you signed up, and we use our own Mailgun account to send email as/from you, so that it just works. We do put a cap on the number of emails you can send without entering your own SMTP credentials (which will also give you better email deliverability), but for users just checking out Close.io, it’s one less configuration step in the beginning. Forget having to BCC/Foward all emails with sales prospects to some random CRM email address. Plug your IMAP credentials once into Close.io and we automatically track your sent and received sales emails regardless of how/where you send them. We have a long list of other little UI/UX improvements we need to make, but hopefully this was enough to encourage you to think twice about the tools you’re using and discover opportunities for improvement. And if you’re a software developer… be sure to sweat the details – it takes more time, but it makes for happier users! On my goals list for 2013 was to write an eBook of some sort. When I was approached to join some other Backbone.js contributors in a “book sprint” to write a book on developing a Backbone.js application, I happily accepted! The process went fairly smoothly (all things considered, when 5 people all write a book at once, mostly over a weekend). There were some challenges with timezones and schedules, but overall the team did a great job getting it done. We started by building our sample project, Hubbub (a GitHub Issues tracker in a Kanban format), upon which we’d base the book. We wanted to build an app that was more complex / real-world than the typical localstorage Todo list example apps out there. You can see the final project live here. Thanks to Casey Foster, Aidan Feldman, David Tonge, and Tim Branyen for co-writing it with me, and for Troy Mott for organizing the book sprint. And now for some SEO love… I hope this book will become one of the best selling Backbone.js tutorial books out there! We use git and GitHub’s Pull Requests fairly heavily in developing Close.io sales software. My main problem with pull requests as code review is that it focuses my attention too much on the specific lines of code added/removed/modified, but not enough on the context of where they were added/removed.